Discover your version of beautiful through aesthetic laser treatment with Cynosure. Stop concealing your skin’s imperfections and get the glowing results you desire. Skin revitalization with Cynosure is a nonsurgical treatment that will improve your skin’s appearance, quickly and easily. This advanced light-based technology clears undesirable brown spots, sun damage, and vessels, revealing clearer skin. How does it work? Specialized pulses target brown spots, sun damage, and vessels without harming the surrounding skin. The light delivered to your skin causes them to slowly disappear through your body’s natural healing process. What results can I expect? Expect to see a decrease in the appearance of brown spots, sun damage, and vessels for a more even skin tone. A series of treatments may be needed for desired results. Treatment plans can be adjusted to fit everyone’s lifestyle – speak to us regarding desired downtime, comfort, and results. 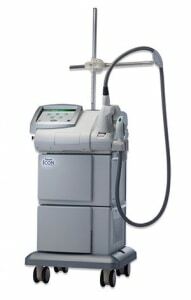 Younger looking skin is easier than you think with laser skin resurfacing. In just one treatment, you can have a more youthful appearance, with improved skin tone and texture. Achieve long-lasting results without the pain or side effects associated with a more invasive surgery. Best of all, you will still look like you – only better. How does it work? This fractional technology uses micro-beams of energy to create areas of affected tissue that extend through the epidermis into the dermis. This triggers the body’s natural healing process to create new, healthy collagen. What results can I expect? You will have an improvement in both tone and texture, resulting in younger looking skin. Treatment plans can be adjusted to fit everyone’s lifestyle – speak to us regarding desired downtime, comfort, and results. Stretch Marks are common for many men and women. When skin has been stretched too far or too fast – such as during puberty, pregnancy, or weight fluctuation – these unsightly lines appear. Finally, there is a treatment that will restore smooth and beautiful skin. Laser stretch mark removal is fast, easy, and virtually pain free. How does it work? This fractional technology uses pulses of laser light to target and break down stretch marks, triggering new tissue production underneath the skin. This new collagen will help improve both the texture and color of the stretch marks. What results can I expect? You can expect to see a decrease in the appearance of your stretch marks and a smoother texture of your skin. Treatment plans can be adjusted to fit everyone’s lifestyle – speak to us regarding desired downtime, comfort, and results.